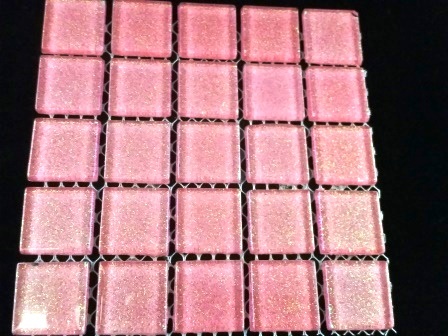 $5 SHEET x 25 GLITTER GLASS TILES! YOU NEED THESE IN YOUR MOSAIC STASH! Each tile: 2.5 x 2.5 cm x 4mm thick. 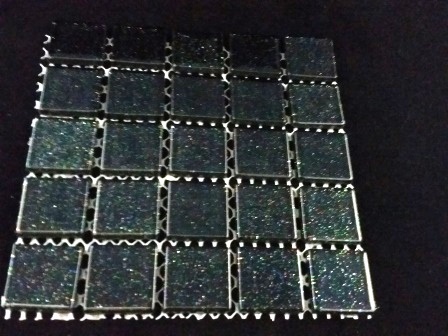 Beautiful glitter-backed or foil backed, sealed glass mosaic tiles. Shipped on fibreglass mesh, but easily pulled of the mesh to use whole or reshape with nippers! PRINCESS PINK GLITTER! Absolutely beautiful! Shimmers and sparkles! 1 sheet of 25 glass mosaic vitreous tiles. Each tile is 2.5cm x 2.5cm x 4mm thick Glitter is applied to the back of the glass tile and sealed. Suitable for indoor mosaics. May fade over time if used outdoors. 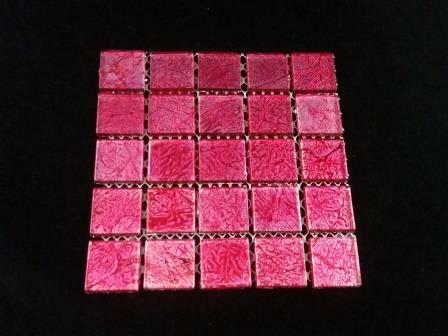 CHERRY FOIL BACKED - GLASS MOSAIC TILE 1 sheet of 25 glass mosaic vitreous tiles. Each tile is 2.5cm x 2.5cm x 4mm thick Foil is applied to the back of the glass tile and sealed. Suitable for indoor mosaics. May fade over time if used outdoors. 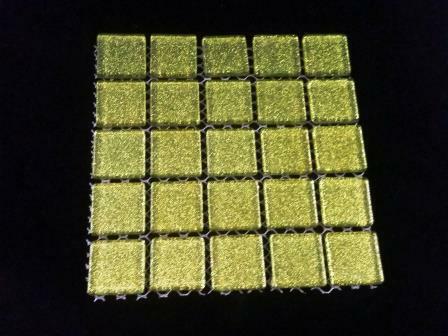 LIME GREEN GLITTER - GLASS MOSAIC TILE 1 sheet of 25 glass mosaic vitreous tiles. Each tile is 2.5cm x 2.5cm x 4mm thick Glitter is applied to the back of the glass tile and sealed. Suitable for indoor mosaics. May fade over time if used outdoors. 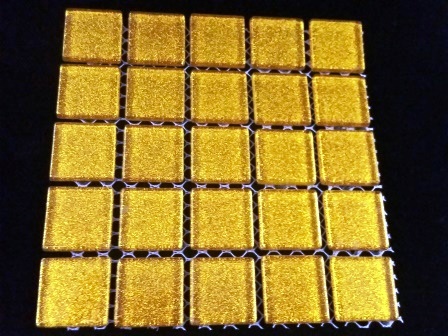 BRIGHT GOLD GLITTER - GLASS MOSAIC TILE 1 sheet of 25 glass mosaic vitreous tiles. Each tile is 2.5cm x 2.5cm x 4mm thick Glitter is applied to the back of the glass tile and sealed. Suitable for indoor mosaics. May fade over time if used outdoors. 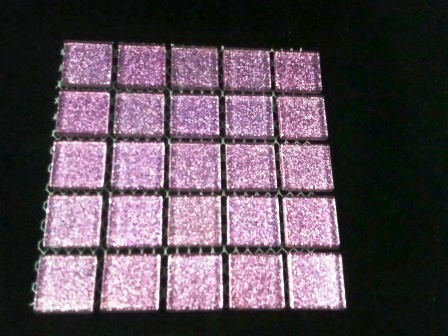 LIGHT PURPLE GLITTER - GLASS MOSAIC TILE 1 sheet of 25 glass mosaic vitreous tiles. Each tile is 2.5cm x 2.5cm x 4mm thick Glitter is applied to the back of the glass tile and sealed. Suitable for indoor mosaics. May fade over time if used outdoors.